This is the main furnace structure at Lockridge Furnace in Alburtis, Pennsylvania. Today it houses a museum that details the iron industry in the lehigh Valley in the 1800s and early 1900s. 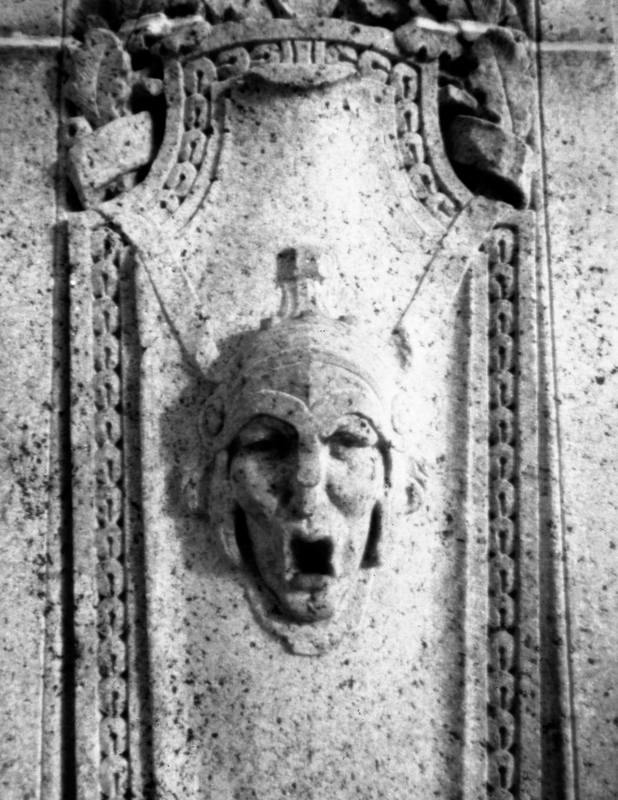 Scanning: Negative scanned with Epson V600 in two scans and merged back together in PhotoShop since the V600 doesn't natively support 4x5 scans in one pass. Cropped to desired size in Lightroom 4. 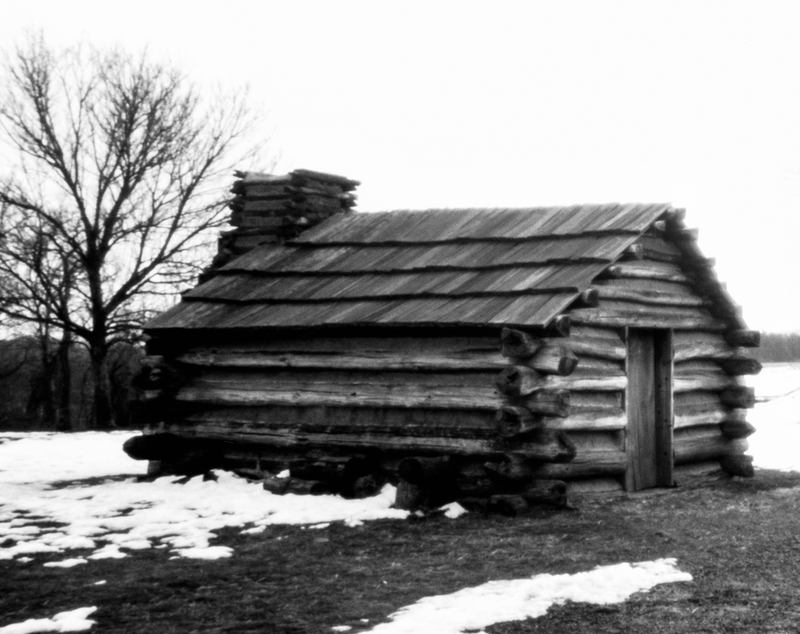 A cabin on the site of a brigade encampment led by General Peter Muhlenberg during the long, hard Winter of 1777-78 at Valley Forge. 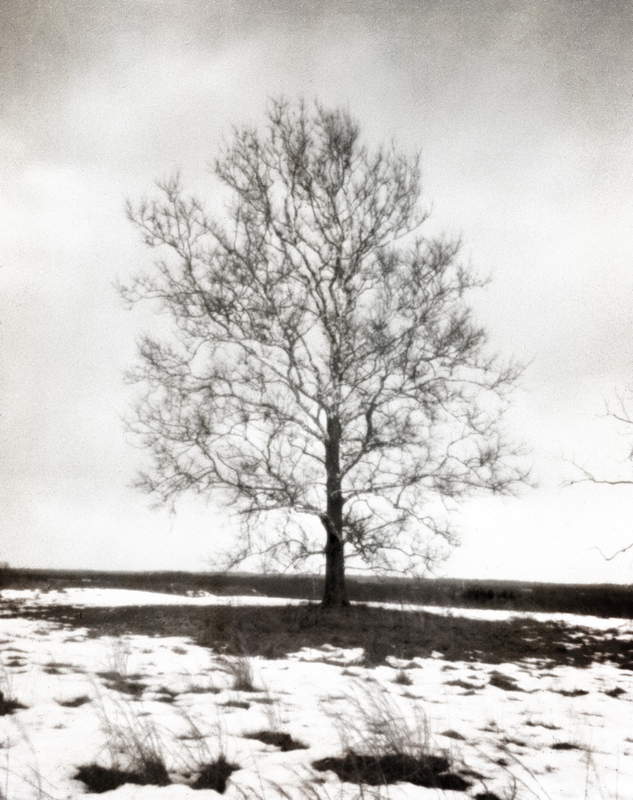 Created at Valley Forge National Historic Site with a homemade wooden 4x5 large format pinhole camera. St. Paul's UCC Church Cemetery in Amity, Pennsylvania contains some very old gravestones, some dating back to the 1700s. A nice setting for a shot with the 4x5 pinhole camera. 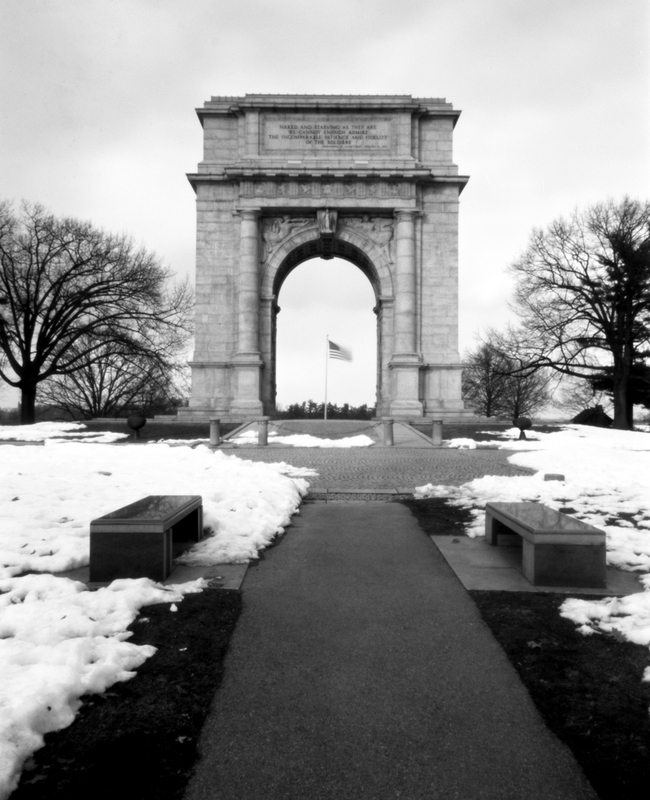 The United States Memorial Arch, located at the intersection of Outerline Drive and Gulph Road within the Valley Forge National Historic Site, was erected to commemorate the arrival of General George Washington and his Continental Army into Valley Forge. How lawn furniture hibernates. 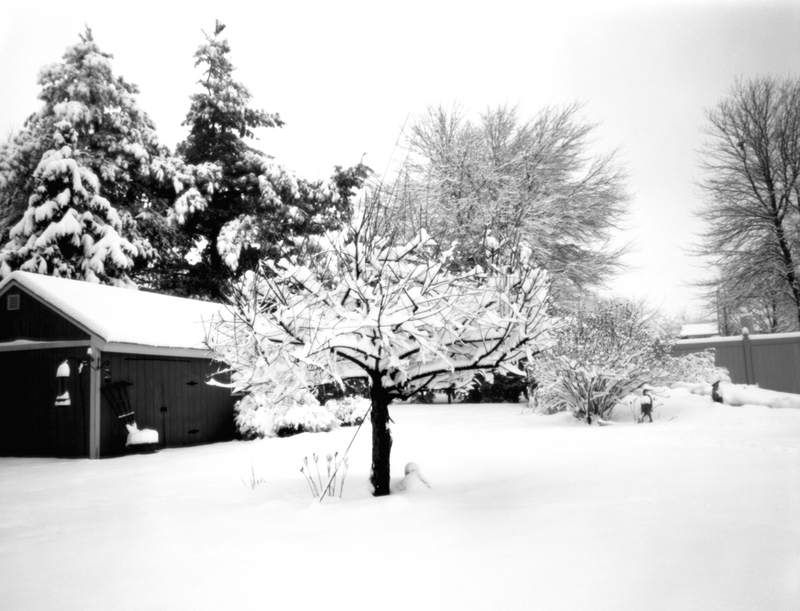 This will be the last of the 4x5 large format pinhole shots featuring snow for a while. We are supposed to get one more really good snow storm on Wednesday into Thursday and then the forecast around here is calling for temperatures in the upper 30s to 50s on some days so hopefully the snow will all melt and I can get on to some more interesting landscapes with the regular 4x5 camera. Have I mentioned how much I hate snow ? I probably have. 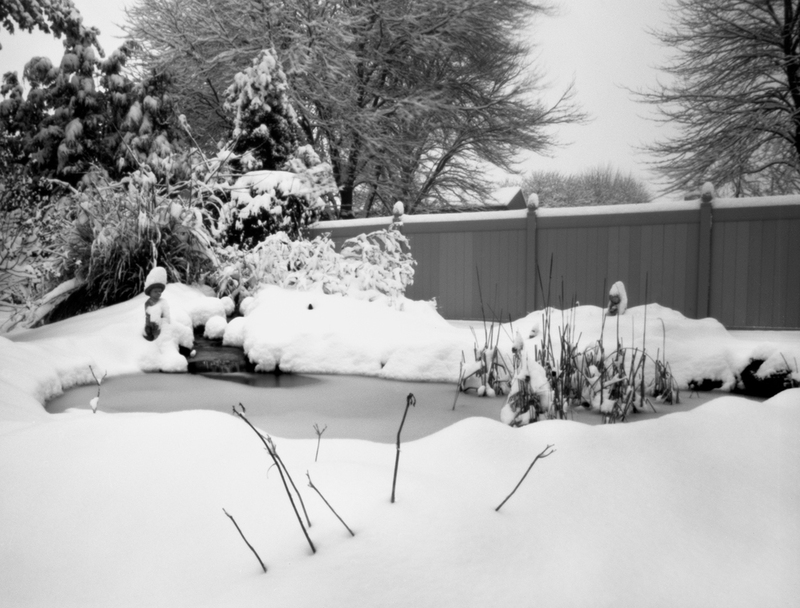 A 4x5 large format pinhole shot of the pond and waterfall in our backyard. The fish are cold, very cold. Always time enough to sit and count the snowflakes. This is another 4x5 large format pinhole shot from Lockridge Furnace in Alburtis, Pennsylvania. Camera: 4x5 large format wooden and brass pinhole camera. 0.4mm diameter laser cut pinhole, 90mm focal length giving F225 aperture. Today's project entry is another pinhole shot from Lockridge Furnace in Alburtis, Pennsylvania. This is one of the railroad sidings that has been converted to a walking trail through the park area. It was once used to haul the raw materials into the furnaces at the Lockridge Furnace complex. One of the rail carts is visible on the remaining section of track. 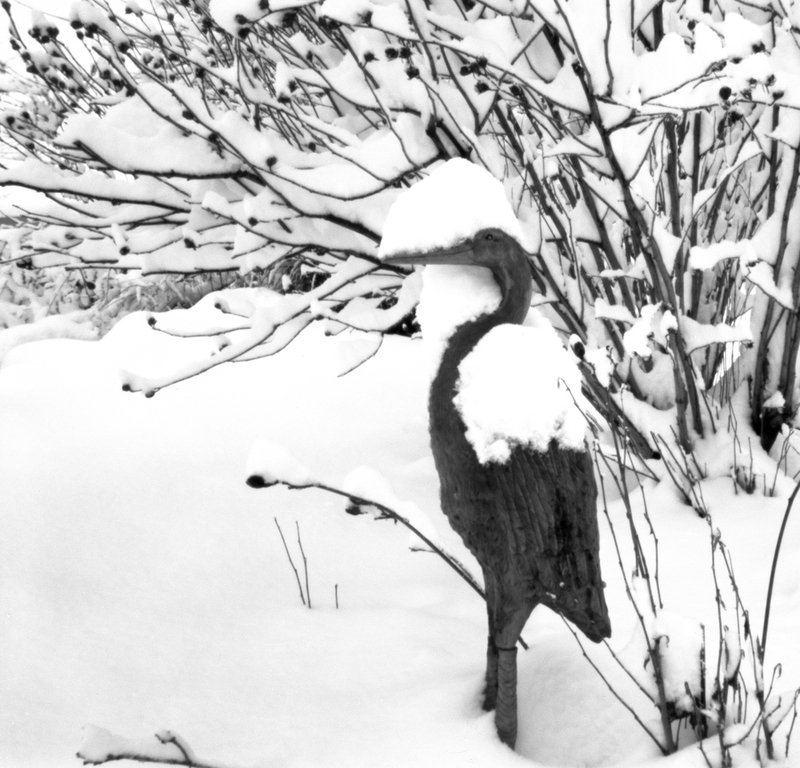 Gabe the Great Blue Heron does his best Snowy Egret impersonation while secretly wishing he had gone to Florida with the rest of the boys in November. Cheer up Gabe, the forecast is for two feet more of snow this weekend. After having a snow forecast that promised only 3-6 inches of snow today, we ended up getting about 11 inches. This was the first of three such storms we are expecting this week. Have I mentioned how much I hate Winter this year ? I decided to take the 4x5 pinhole camera out in the backyard for a few shots about halfway through the storm. In retrospect it was probably a bad decision. When I would pull the dark slide it ended up becoming covered with falling snow and then I had to find a way to dry it off before I put it back in the film holder. I need to outfit the pinhole with a plastic rain/snow jacket and put a pocket in the back to hold the dark slide and keep it dry.